CBS’s annual People’s Choice Awards are one of the few big-name award shows in which average citizens get a voice, with online voting determining the winners of the ceremony’s 64 categories (ranging from Favorite Movie all the way over to Favorite YouTube star). As such, the PCAs present a somewhat different picture of America than the one we get from the Oscars, the Critics’ Choice Awards, or the Emmys, one in which Tom Hanks is king, Ellen DeGeneres is queen, and Johnny Depp is still invited ‘round to dinner. 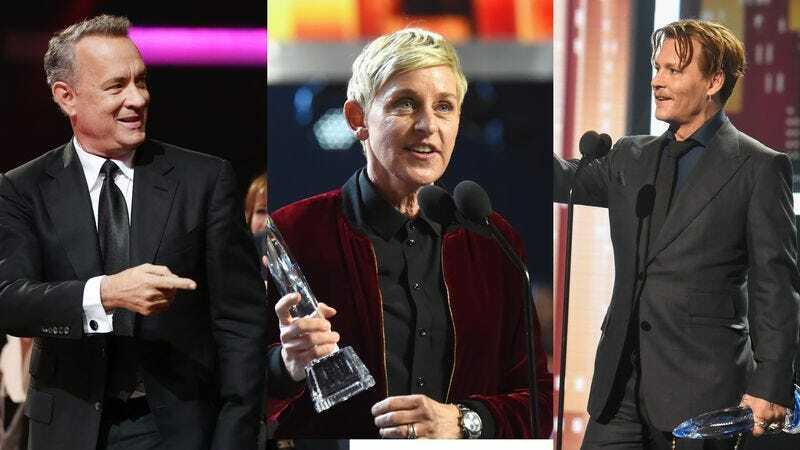 DeGeneres was the big winner at this year’s awards, winning Favorite Animated Movie Voice and Favorite Movie for her Pixar sequel Finding Dory, and Favorite Daytime TV Host for Ellen. (Jimmy Fallon, meanwhile, was the People’s Choice for late-night, hair-tousling fun.) Certifiable charm monster Tom Hanks earned Favorite Dramatic Movie Actor for Sully, but lost out to Johnny Depp in another category; apparently, the ugliness of Depp’s 2016—which bounced between box office flops like Alice: Through The Looking Glass and Yoga Hosers, and the nastiness surrounding his bitter divorce from Amber Heard—didn’t dissuade America from naming him its Favorite Movie Icon of the year. Meanwhile, the show’s increasingly granular TV awards—which now number 32, cutting the landscape up into network, cable, premium, and a variety of genres—offered up a mixture of the predictable and the surprising. The Big Bang Theory was, of course, the Favorite Network Comedy of the night, but it lost out on Favorite TV Show to Starz’s Outlander. And despite what the fate of Joey might have you think, America’s still apparently in love with Matt LeBlanc, whose Man With A Plan beat out The Good Place as the preferred new comedy of 2016. Variety has the full list of nominations and winners, in case you’re desperate to see how many different shows This Is Us defeated for Favorite New Drama (a bunch), or how many awards Bates Motel deservedly pulled down (three, basically sweeping the cable drama portion of the show).